Benzer Pharmacy is excited to provide a new service to the community that will save patients time, money and hassle when it comes to their prescription drug refills. “Many patients and families have multiple medications and getting all those refills can require several trips to the pharmacy each month,” says Wendy Cavanaugh, Clinical Coordinator at Benzer Pharmacy. The team at Benzer Pharmacy will offer a week-ahead check-in for those enrolled to make sure there haven’t been any changes in their medications and will also remind patients the day before their prescriptions are ready for pickup. Private consultations with a pharmacist are also available for any patient who requests. “We are excited to enroll new patients to this program,” says Wendy. “A new national opinion survey found that 83 percent of patients signed up for Medsync services say that they are very helpful in managing their prescription refills.” The survey was conducted by Langer Research Associates. 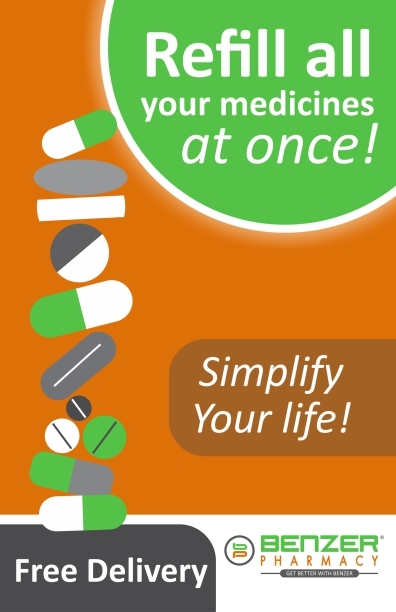 The term medication adherence describes the extent to which a patient takes their medications correctly. The cost of non-adherence is estimated to be as high as $290 billion annually, according to NEHI. According to a first-of-its-kind patient survey, entitled Medication Adherence in America: A National Report Card, when it comes to taking medications correctly, Americans 40 and older with a chronic medical condition earn a troubling C+ on average and one in seven of these people received an F.
The Medsync program at Benzer Pharmacy can reduce these costs by helping patients stick with their medications and avoid costly health care procedures or interventions.